Prepare to be “wow’-ed with today’s featured wedding in Virginia! It is a romantic and heartfelt as it is stunning and gorgeous in a Virginia countryside setting! Jay and Nisha are one stunning couple and I can’t get enough of their beautiful multi-cultural Virginia wedding! The pair tied the knot in an Indian and Jewish ceremony in Somerset, Virginia at the outdoor wedding venue, The Market at Grelen. The duo incorporated nods to both of their heritages and religions throughout the day, but especially during the wedding ceremony. The groom partook in his tradition of the breaking of the glass while also participating in her tradition of the breaking of a clay pot. Many of their customs and details were similar in nature, making the planning of this big day easier than one might think The Jewish chuppah the pair wed under looked similar to the Indian mandap that couples traditionally wed under – and did we mention how gorgeous it was in bright colors of yellow and red?! But the bride’s gown or sari is my personal fave; it was even her mother’s before and she had it altered to fit her on the wedding day. So much beauty throughout this event, just wait until you see their tented reception (Don’t worry, that’s coming up tomorrow!). 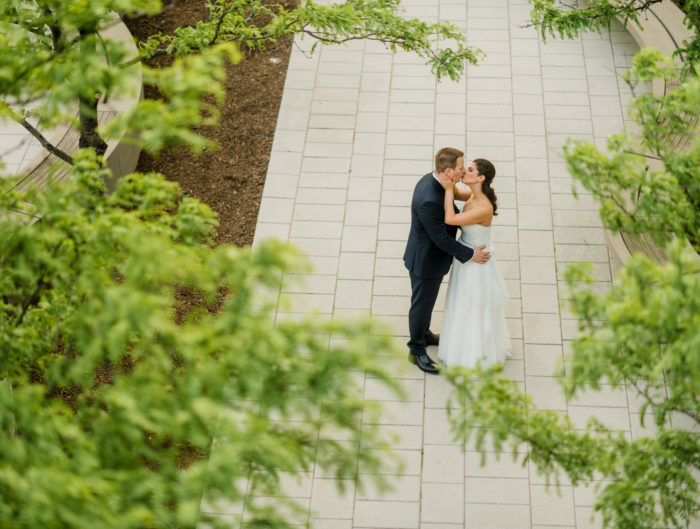 A special thanks to Washington DC area wedding photographer, Ksant Photography, for sharing Nisha and Jay’s wonderful wedding with us. From the bride: We knew we wanted to combine elements of both Jay’s Jewish customs and Nisha’s Indian customs into all aspects of our wedding. Luckily, we found out that both cultures have very similar traditions! Nisha wore her mom’s wedding sari that had been altered into a beautiful western style dress. Jay wore Indian clothes for the ceremony and changed into a suit for the reception. We had a custom built chuppah, which is identical to an Indian mandap and decorated it with Indian flair and colors. Jay had personalized yarmulkes in a variety of colors to match up with the bright colors typical to Indian weddings. The wedding ceremony included a mix of both cultures and religions. Jay first broke a clay pot for Indian tradition and ended with the Jewish custom of breaking a glass. Jay – For me, my favorite wedding day memory was taking pictures in the peach orchard before the start of the ceremony. I was completely relaxed and Nisha looked gorgeous in her wedding sari / dress. I could see the slight nervousness in her and I felt like I was able to comfort her with my silliness during the photoshoot. There were so many cultural touches that we had in the wedding. Jay rode in on a horse to begin the festivities. There was a mehndi (henna) artist for our wedding guests the night before the wedding. Nisha – For me, the most memorable part of the wedding day, was walking down the aisle with my uncle and father. I have never been the type of girl who dreamed of that moment, but I have to say it was pretty emotional. Jay was waiting for me and I couldn’t believe we would finally get to be husband and wife! Congratulations to Nisha and Jay! 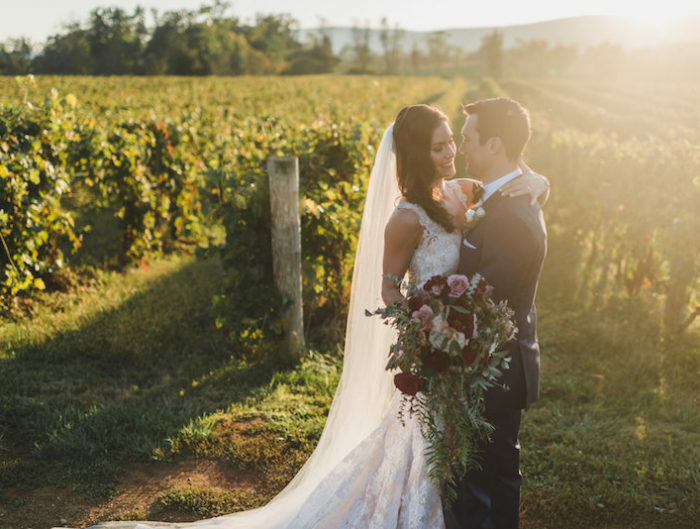 Thank you for sharing your beautiful multi-cultural outdoor Virginia wedding with us! Stay tuned for their sweet tented wedding reception up tomorrow!